I stumbled upon a YouTube video of Joe Walsh performing Rocky Mountain Way at the 2004 Crossroads Guitar Festival. I like Joe Walsh. He’s a great and underrated guitarist. But I noticed he was playing with the slide on his middle finger. Which got me to thinking about all the variations and permutations there are to playing slide guitar. Which is what I intend this series to be about. He wears the slide on his middle finger. Also enjoy the Talk Box. Pinky. Bob Brozman and Stefan Grossman and many others recommend you learn to play with your slide or bottleneck on your little finger. This method is favored particularly by many acoustic blues guitarists and those trying to play like the early pioneers. 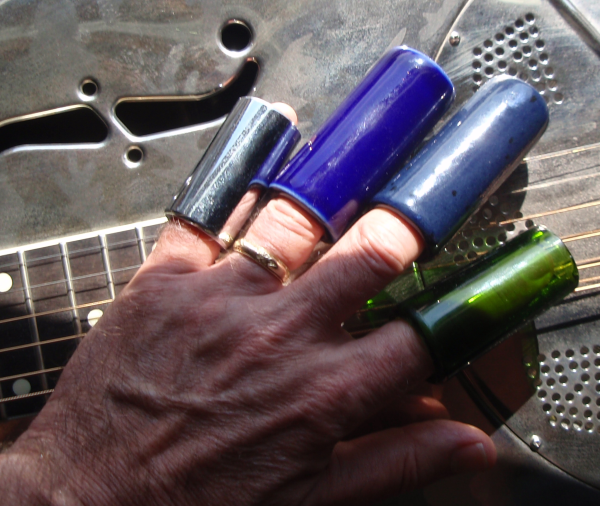 The big advantage of wearing the slide on your pinky is it gives you your first three fingers for fretting. These are the fingers you are most used to using for playing runs and chords. All the videos I could find of Eric Clapton show him playing with the slide on his little finger, though I had thought I’d once read that he played with it on his ring finger. I must be mistaken. Ring Finger. The ring finger is another popular choice. You still have your first and middle fingers for chords and runs – not as versatile as having the slide on your pinky, but not too bad. The advantage many find is you have better control of the slide when it is on your ring finger. I have recently begun to experiment with the slide on fingers other than my pinky. I had tried playing with the slide on my ring finger 30 to 40 years ago but when I got a National Style O I attempted to learn to use the slide on my pinky. Now I’m rethinking where to put the slide. Rory Block, one of the best interpreters of Robert Johnson I’ve heard, plays with the slide on her ring finger. So does Derek Trucks. Middle Finger. I wouldn’t have thought the middle finger would be very popular, but I’m wrong. I’ve already mentioned Joe Walsh as playing with the slide on his middle finger. Another great slide guitarist who plays this way is Bonnie Raitt. Although I’m sure both Joe and Bonnie can and do play acoustic slide, the fact that they are primarily single line electric guitarists means that being able to play open chords, with alternating bass picking while playing slide isn’t a concern or problem. I’ve tried this and you certainly have as much if not more slide control than when the slide is on your ring finger. First Finger. The most unusual slide I’ve seen is Dave Hole. He is a great player but wears the slide on his first finger and plays slide over the top of the neck so the slide is in front of his free fingers. This is the same position the slide is in if you wear the slide on your pinky and play in a more standard position with your hand around the neck and fingers coming from the bottom of the fretboard. I can think of no advantage for this style other than it works for Dave Hole. Conclusion – there is no wrong finger. Choose what works for you. Good reading..not only where to wear, but I ask where to put your slide when not in use? I have seen Joe Walsh take his off and place on the floor. Thats why I created and use a SlideFly slide holder.